“Where East Meets West” Municipal Airport, Albuquerque, NM. North also meets South here, as this is the crossroads for TWA and Continental Air Lines. 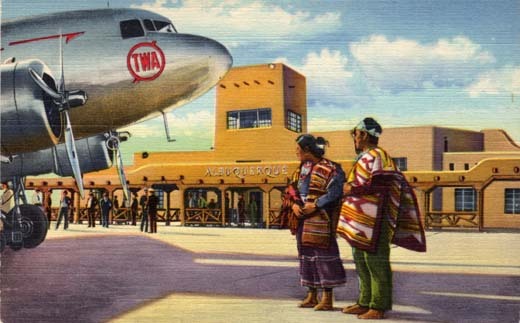 The mammoth TWA Stratoliner is being inspected by Navajo Indians, amazed at seeing “chi-di-nah-tah-ee” (wagon that flies) at close range. J.R. Willis, Box 665, Albuquerque, N.M.